Dinner: Served at 7:00 - Noho's Hawaiian Buffet Dinner. 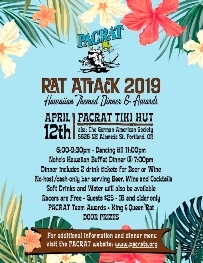 Awards after dinner: Awards will be handed out, including team winners, King and Queen Rat, and all the other fun that goes along with it! We will also be selling 50/50 tickets, winner wins half the pot, so bring some extra cash.